The Nexus 9 wasn't designed to be an iPad killer; it was designed to inspire Google's Android partners to create one instead. 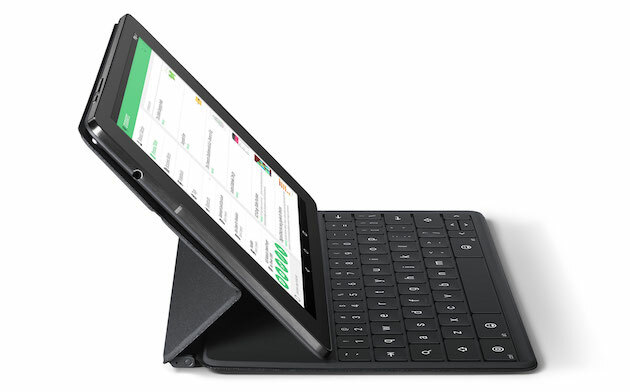 Though you'd be forgiven for thinking otherwise: It was announced one day before the iPad Air 2 and mini 3, comes with a powerful 64-bit NVIDIA chip and will be competitively priced with Apple's tablets. But Alberto Villarreal, head of the Nexus 9's industrial design, insists that this wasn't the purpose. "We wanted to accelerate the premium market for Android tablets," Villarreal said. 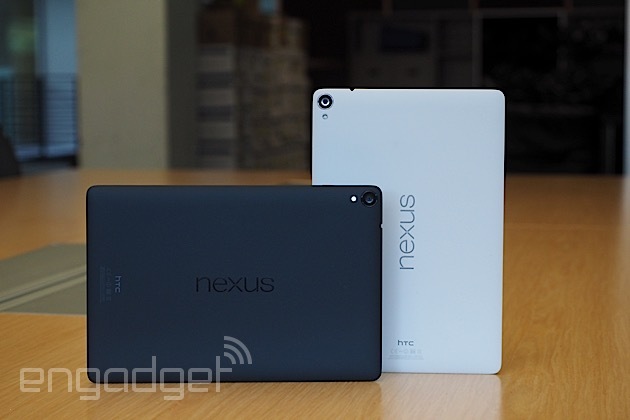 "[The Nexus 9] has a lot of attributes and definitely will bring the quality for other companies to do better." The Nexus 9 had to be a shining example in much the same way that last year's Nexus devices, the 5 and 7, showed manufacturers that it's possible to create inexpensive phones and tablets that look good and perform well. The team needed a partner with experience in creating premium devices, so it turned to HTC. The team needed a partner with experience in creating premium devices, so it turned to HTC. "We saw the One and really liked how their designs were very simple, focused on usability and removed things that didn't need to be there," Villarreal said. "They have nice craft and precision details and materials." HTC handled the Nexus 9's production and worked closely with Google on its design and materials, but it looks unlike anything the Taiwan-based manufacturer has made before. The well-hidden BoomSound stereo speakers on the front are distinctively HTC, but otherwise the tablet looks like a blown-up version of the Nexus 5: The straight sides, matte soft-grip (polycarbonate) back and even the camera placement offer a very striking resemblance. (Villarreal helped design the Nexus 5 as well.) But the 9 takes on more of a premium appearance than last year's smartphone thanks to its use of aluminum. If the design team entertained the idea of an all-metal device, the thought didn't stick. It preferred a layered approach: The aluminum sides provide rigidity and protection, in addition to its premium appearance, while the polycarbonate is meant to offer a better grip and more color options. And while the Nexus 9's three hues -- black, white and sand -- aren't exactly vibrant or eye-catching, a lot more consideration went into selecting the right shades. "We're moving away from technology-driven black and silver, which is very common in the industry, and trying to bring more of a fashion look to the portfolio," Villarreal said. While the options don't scream fashion, Villarreal explained that his team chose sand to be more expressive and make a statement. The black shade has a slight blue tint when viewed from certain angles, and the white option is actually closer to gray to combat dirt and grubby hands. The size of the 9 places it firmly in the middle of the tablet spectrum, between larger tablets like the iPad Air and Nexus 10 and smaller ones like the iPad mini and Nexus 7. I much prefer the screen's 4:3 aspect ratio over the 16:10 panel on the Nexus 7. It may not make a huge difference when watching movies in landscape mode, but it definitely will in portrait. A 9-inch screen using 16:10 would simply be too long for comfort. The size of the 9 places it firmly in the middle of the tablet spectrum. Early in the development process, Google experimented with a wide variety of shapes and sizes. Villarreal said the number of design prototypes was "countless." It settled on this particular design because it's still portable and light enough for travel, but large enough to use as a productivity tool and entertainment device. Indeed, it's smaller and lighter than the iPad Airs and feels more portable. It also rivals Apple's tablet in performance -- on paper, anyway. If Google wants to prove it can be a serious productivity tool, this is the company's golden opportunity. The Nexus 9 is packing a dual-core 2.3GHz NVIDIA Tegra K1 chipset, but don't let the number of cores fool you: We've already seen a glimpse of what the first-generation K1 can do, and it was a fantastic performer. The new Nexus comes with the next-gen Denver K1, which comes with 64-bit support and is supposed to be even more powerful. Since it was built with productivity in mind, Google also constructed a mechanical keyboard that doubles as a protective cover. It's 5mm thick, attaches to the Nexus magnetically, comes with NFC for easy pairing and is supposed to last several months on one charge. Since it's not quite as spaced-out as desktop and laptop boards, it'll still take some time to get used to, but the keys didn't feel quite as cramped as I expected. "We worked together with the software team from the onset -- it was a super-close collaboration." 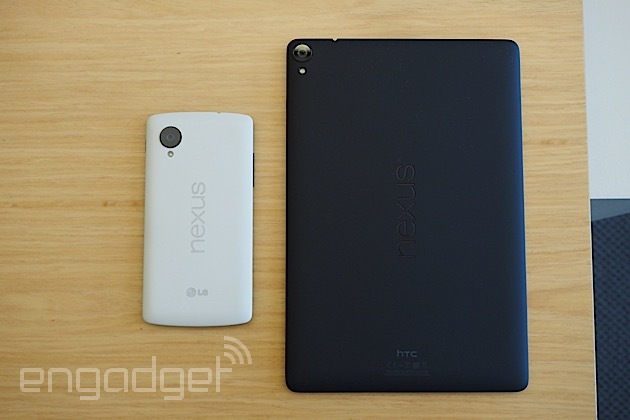 One of Google's primary advantages in building a Nexus tablet is its control of both the hardware and software. 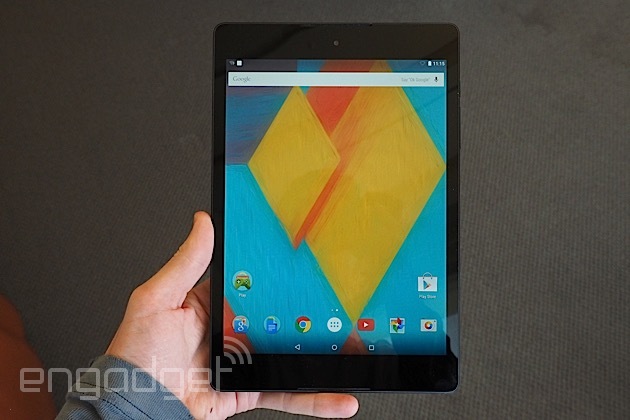 As a result, the Nexus 9 was designed with Android 5.0 Lollipop already in mind. "We worked together with the software team from the onset -- it was a super-close collaboration," Villarreal said. The new version of Android feels incredibly fresh, primarily due to Material Design, which is cleaner, flatter and more intuitive. At a baseline cost of $399, the Nexus 9 is priced competitively against Apple's iPad mini 3 and older Air, and it has plenty of power behind it. It may seem odd that the $200 Nexus 7 is no longer available as a more affordable option, but this move falls right in line with Google's new strategy: Create a premium benchmark for its partners to follow. Instead of going into battle alone, it's recruiting an army.